This page will share the solution for fixing problem on C drive low disk space on Windows Server 2012, SBS 2012 and Windows 2012 R2. Download IM-Magic Partition Resizer Server to increase size of C drive when it is lacking free space on Windows Server 2012. Partition magic is the best choice to fix low disk space problem on Windows Server 2012 C drive, because it provides an efficient way to resize the hard disk without reinstalling system or repartitioning hard disk. Therefore, you will not lose any data by using the partition magic to fix the problem when C drive is running on low disk space. As partition magic tool, IM-Magic Partition Resizer Server has the function of extending partition, shrinking partition and moving partition, etc. How to Fix When Running out of Space on C Drive? Download, install and launch IM-Magic Partition Resizer Server. 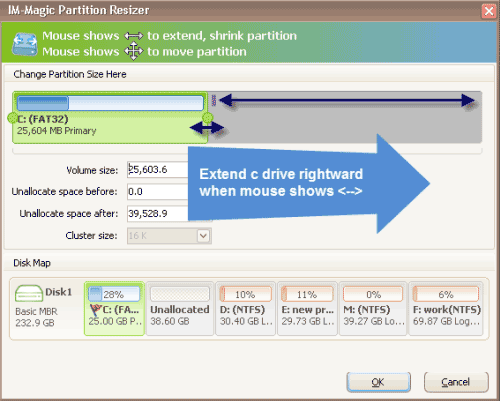 Right click a partition that has lots of free space and select "Resize/Move" option. You can move the arrows to shrink the selected partition to squeeze some unallocated space. The unallocated space will display beside the selected partition. How to Make Unallocated Space? Right click "My Computer" => select "Manage" =>> select "Disk Management" => right click a partition that has lots of free space and select "Shrink Volume". By following the steps above, you can make some unallocated space by shrinking the partition. Professional partition magic is able to help shrink partition so as to generate some unallocated space. The advantage of professional partition magic is that it can move partition. After creating unallocated space, you can rely on the partition magic to move the unallocated space close to C drive or any other partition you want to extend. After creating unallocated space, you can add the space to C drive to fix the low disk space. If the unallocated space is right behind C drive, you can open Disk Management to add the unallocated space to C drive. You need to delete the partition between C drive and unallocated space if the unallocated space is not behind C drive. However, you will lose data after deleting partition. In this situation, professional partition magic is helpful with the partition resizing without deleting any partition. Thus, you will not lose any data. 1. "My PC with Windows 2012 only has about 30GB space for C drive and used about 20GB space for operating system. After installing some programs, now C drive is nearly full. There is another two partitions D drive and E drive on my PC, and only E drive still has some free space. I tried to increase the size of C drive under Disk Management, but the Extend Volume option is grayed out. How can I extend the C drive space on Windows Server?" 2. "There is no available space on C drive on my Windows SBS 2012, but the C drive used space is getting full day by day even I don't save any data to this partition. I need to remove cookies caches every day to free up space on C drive, but C drive free space is less and less. 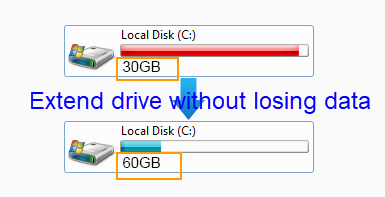 How can I increase the size of C drive without formatting the hard disk?"